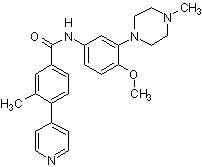 5-HT1B / 1D antagonist (pKi = 8.5), often used in tritiated form as a radiolabelled probe. Shows approx. 100-fold selectivity over other 5-HT receptors and shows CNS and oral activity. Publishing research using ab120349? Please let us know so that we can cite the reference in this datasheet. There are currently no Customer reviews or Questions for ab120349.